WALTHAM, Mass., March 30, 2018 /PRNewswire-USNewswire/ -- Bentley University will name its Center for Women and Business after the university's 7th president, Gloria Cordes Larson, as a tribute to Larson's legacy of empowering women to lead and elevating the national conversation on gender equality and diversity in the workplace. Founded by Larson in 2011, the Center has become a trusted thought leader on this increasingly important and relevant topic. The Center's mission and critical work reflects Bentley's commitment to advancing women from the classroom to the boardroom. "The founding of the Center for Women and Business under Gloria Larson's leadership comes after a long career spent blazing new trails for women in government and business. She understood workplace gender equality issues were not going to be an easy fix--we needed to both focus on preparing students for the world we want to see tomorrow and help businesses enact meaningful changes today," said Board of Trustees Chair Steven Manfredi '73. "Gloria has worked tirelessly to empower other women and it's only fitting that the Center's efforts to strengthen gender equality in the workplace will be forever associated with Gloria's name." In today's workplace, equality and diversity are not just moral issues, they are financial imperatives. Studies show that companies that are more diverse outperform those that are not. It's up to higher education to prepare the next generation to understand how to lead and succeed in a complex and diverse environment. The Center for Women and Business prepares students for success and leadership in the workplace through experiential learning and academic theory. 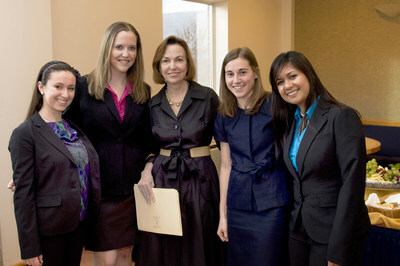 In 2017, through the support of Liberty Mutual, the Center launched the Women's Leadership Program in which high-potential female students receive a yearly financial award to participate in a four-year program that enhances their leadership skills, boosts their confidence, and increases their understanding of gender equality through workshops, academic courses and mentorship opportunities. "The Women's Leadership Program has been a great way for me to connect with other women leaders and to develop my own leadership skills," said Tabitha Levengood, a student participant. "There are so many different programs and corporate visits, in addition to courses that focus on the role of women in the business world. I'm learning confidence and skills that will help me in my career long after graduation." In addition to developing student leaders, the Center for Women and Business works with companies to provide training on workplace diversity and helps them advance their diversity goals, engaging professionals at all levels from early career up to the C-suite. "Bentley's Center for Women and Business' corporate impact is significant," said Michael Simonds, president and CEO of Unum US. "Their program content is data-driven and they know what it takes to help organizations build more inclusive, productive, working relationships among all colleagues at all levels of the pipeline." The Center's increasing number of partnerships with top companies and growing profile as a voice for workplace gender equality are emblematic of Bentley's continued rise as a nationally recognized business university on the cutting edge of workplace issues. "Promoting productive, effective workplace relationships has never been more mission critical for successful businesses," said Larson. "I could not be more proud of the work that the Center for Women and Business does to help advance women in the workplace and to build the next generation of leaders -- women and men -- for the workplace of tomorrow. I am humbled to see my name added to the Center, and my hope is that it inspires even more young women to reach for their dreams." While retiring as President of Bentley on June 30th, Larson will remain on the Board of the Center for Women and Business, actively supporting the Center's mission long into the future. Bentley University is one of the nation's leading business schools, dedicated to preparing a new kind of business leader with the technical skills, global perspective and ethical standards required to make a difference in an ever-changing world. Bentley's diverse arts and sciences program combined with an advanced business curriculum prepares graduates to make an impact in their chosen fields and their lives. The university enrolls approximately 4,000 undergraduate and 1,000 graduate students. Bloomberg BusinessWeek ranked Bentley a top 10 undergraduate business school.